On holiday in the Italian Alps, Pope Benedict took time out to answer questions from 400 priests of the local dioceses on issues ranging from post-Vatican II confusion over Church teaching, to the need to care for the environment. According to reports, in a meeting on Tuesday with Italian priests, Pope Benedict also spoke about the duty of all Catholics to spread the Gospel and the need for the human race to listen "the voice of the Earth" or risk destroying its very existence. "We all see that today man can destroy the foundation of his existence, his Earth," he said in a closed door meeting on Tuesday, according to Reuters. "We cannot simply do what we want with this Earth of ours, with what has been entrusted to us," said the pope, who has been spending his time reading and walking in the scenic landscape bordering Austria. Catholic World News says that the Holy Father met with the priests of the dioceses of Belluno-Feltre and Treviso, in a parish church near his vacation cabin in Lorenzago di Cadore. Pope Benedict reminded the priests that all Christians, and especially clerics, have a fundamental obligation to inform people about the faith. Their efforts, he says, should be aimed not to win arguments but to win souls, bringing new believers into the Church. Reporters were not allowed to attend the full session, but saw a portion of the pope's talk. Later, Vatican spokesperson Fr Federico Lombardi briefed reporters about the meeting. 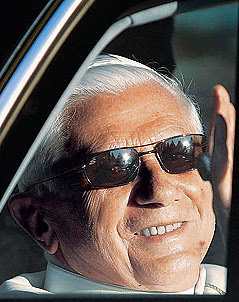 Following a pattern that he has set in similar meetings in the past, Pope Benedict devoted most of the 2-hour session to answering questions from the priests.